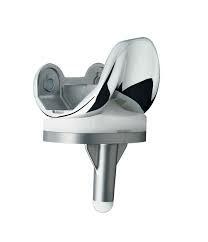 A knee joint, of course. I gave PB a new knee for Christmas, complete with a two night stay at an all-inclusive resort, of sorts. The get-away included all the meatloaf and cable TV he wanted, loungewear with a breezy backside, and hourly blood pressure checks. The ice machine and crutches were extra, but I threw them into the package deal. Upon checkout, PB was presented with a lovely tote bag filled with goodies — a plastic cup, a box of kleenex and a cute pair of bright yellow socks. And a bottle of pain killers. I guess PB and I won’t be going out dancing this New Year’s Eve. But then, we’ve never gone out dancing on New Year’s Eve. At least we can still kiss at midnight. He sure knows how to close out 2015 with a bang. This entry was posted in Family File. Bookmark the permalink.